BMW had a go with a more serious sports cars for several times in history, let’s take M1 for example, while Mercedes in that sense had plenty of offer and a lot of that was recent, as SLR McLaren, SLS AMG and finally AMG GT were going one after another. Audi on the contrary, never found enough courage to try something extraordinary, until 2006 happened, and R8 debuted. Striking looks, incredible cornering ability, and immensely powerful V8 and V10 engines made the perfect recipe for a serious sports car. Two years ago the second generation debuted, but only with the V10 engine making starting price at $164k, which is $50k above price tag of the former base model with the V8 powerplant. That made R8 out of reach or unreasonable for many potential buyers and apparently V8 is a thing of no return in its case. But, rumor has it, that V6 version is about to arrive next year, and until that happens let’s see what Ingolstadt prepared to amuse us now. That would be 2018 Audi R8 Sport Edition. It is a special edition of R8, and when we say special, we mean special. Only 200 of them will be made, and that is globally, which makes it quite special, and you can order it in May this year. So, if you like the stuff written bellow, be very quick. And one more thing, this edition will rob you of €181k ($193k) for a V10 version or €205k ($218k) for V10 Plus model in Europe. That is €16k ($17k) more in the case of more affordable version and €18k ($19k) more if you go with top version. Let’s say acceptable, purely because of the numbers in which it is going to be available. Not that much, if we are honest. You can opt for the black-white or silver-red theme. In the case of later one, the car is painted in special silver tone, while side blades, mirrors, and brake calipers are red, acting as a striking contrast. Alloys are unique 10-spoke pieces covered in gloss black coloring with a silver rim. On the inside, the black leather interior is contrasted with bright red, covering patches on the seats and doors, along with red stripe on top of the steering wheel. Dash and lower console inserts are carbon motivated, although you can go with that outside this version, but dark silver stitching, R8 seat logos, and illuminated door sills with “1/200” lettering are unique to it. As we said, this edition is just pure visual treatment, so nothing new happened here. You can go with 5.2-liter naturally fed V10 delivering 540 hp and 398 lb-ft or with Plus version which pumps out 610 hp and 413 lb-ft from the same engine. Base model reaches 60 mph in 3.5 seconds, while Plus version takes three-tenths less to do the same. If you care about that stuff, top speed is 199 mph or 6 mph more in the case of stronger V10. 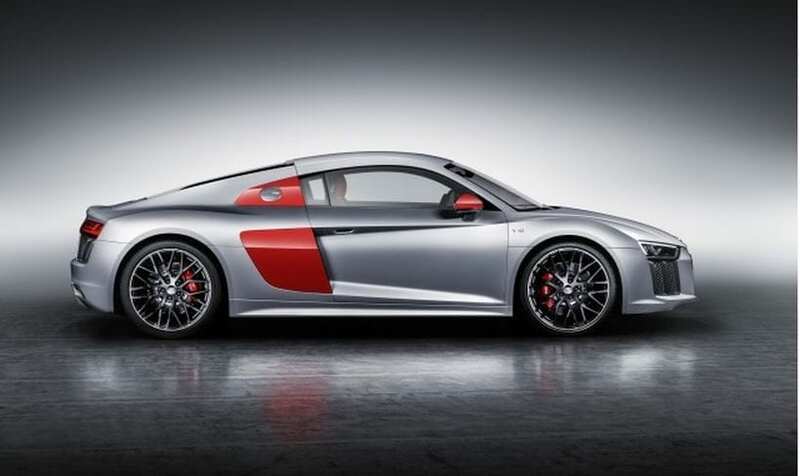 There is nothing particularly special about 2018 Audi R8 Sport Edition, as you can get differently colored side blades and mirrors anyway and mixed black-red coloring on the inside, although done in a different manner. Just one thing makes it special, and that is highly limited production. If you are not shy to cash out extra penny needed for it, you can enjoy it for years and completely forget about depreciation as this type of things can prove very rewarding with resales.